By Presidential Proclamation, October is Italian-American Heritage and Culture Month. 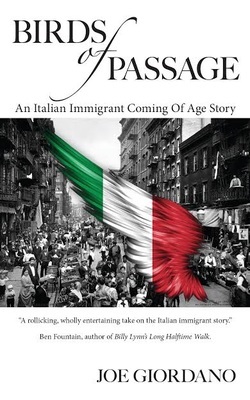 It is timely, therefore, to be reading Birds of Passage, a book that explores Italian migration at the turn of the 20th century, a particularly interesting chapter in the Italian-American experience. The story of Italian migration is one that has long held a certain fascination for me. One of my favourite scenes from The Godfather Trilogy is the moment in Part II when a young Vito Corleone passes the Statue of Liberty on board the Moshulu (Clyde-built by-the-way). An air of fear-tinged-hope is writ large across the faces of the future Don's fellow passengers as they arrive in the New World in search of a better life, while Nina Rota’s sweeping arrangement provides a stirring musical backdrop. Closer to home, my wife is the daughter of Italian migrants. In the 1960s her father left Garfagnana and her mother a small village near Caserta to start a new lives in Scotland. Four years ago I became a migrant myself, starting a new life here in Verona. While my own experience of migration has been relatively benign, I have a certain empathy with the hopes and fears of the migrant experience! Joe Giordano​, the book's author, is something of a bird of passage himself. Second generation Italian-American (his father and grandparents were from Naples), he has lived in Greece, Brazil, Belgium and the Netherlands, before finally settling in Texas. The three central characters in the book are Leonardo Robustelli, the short-tempered but good hearted son of a tenant farmer from Naples; Carlo Mazzi, the privileged son of powerful local aristocrat; and Azzura Medina, a beautiful young Italian-American who waits tables at the family restaurant in the heart of New York’s Neapolitan community. It's 1905 and Leonardo leaves his homeland in search of work and prosperity. Carlo is fleeing in rather more dubious circumstances - he has killed a local rival and is attempting to escape Italian justice in America, but his killing spree only continues as he arrives in the New World. Azzura has ambitions beyond the family restaurant, but is strictly controlled by her parents. Upon arriving in America, Leonardo and Carlo compete for Azzura's affections, but who will win and how far will the new migrants be drawn into the murky underworld of rackets, extortion, kidnap and murder? "The ship pitched savagely, and he was thrown to the starboard deck. He crawled to the hatch. Many other passengers were in a similar state. They made use of the handrail to stumble down the stairs. The darkness and disorientation of the lower deck as the ship rolled caused Leonardo to retch again. No one could control themselves, and vomit sprayed everywhere. Leonardo clawed like a blind man along the line of bunks and managed to reach his. He pulled himself onto the jute mattress. Prostrate, he felt some relief from the nausea. But the roll of the ship threatened to throw him down to the floor. He urgently grasped the iron edges of the bunk. Some passengers reeled from the odor of the vomit and the toilets and tried to make their way back on deck. They collided with those coming down the steps, and the stairs were clogged with tangled bodies struggling in opposite directions. There were cries of anguish for God to help them. Some moaned. Leonardo wondered if his misery would ever end. He was sure that if Dante had sailed in the Prinzessin Irene, The Inferno’s deepest circle of hell would’ve been seasick victims in steerage." The story continues in the mean streets of Manhattan, where, for example, the Irish saloon smelt like an "unwashed beer mug", and the street battle between the striking Irish longshoremen and the strikebreaking Italian migrants, a vivid reminder of the turbulent relationship between these two migrant communities. Between 7-11 November, the Kindle copy of Birds of Passage will be free to download from Amazon.